This week, the capital will be awash with photography, as Photo London comes to town for the first time in almost a decade. Under new management, the revived fair will welcome more than 70 international galleries to Somerset House over the spring Bank Holiday weekend. Organisers hope the range of exhibitions and events will attract photography enthusiasts and the general public alike. 10. 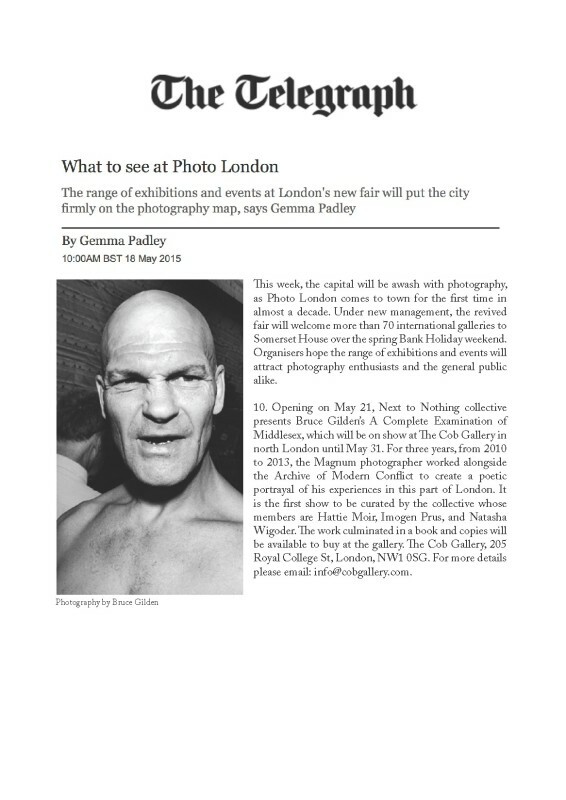 Opening on May 21, Next to Nothing collective presents Bruce Gilden’s A Complete Examination of Middlesex, which will be on show at The Cob Gallery in north London until May 31. For three years, from 2010 to 2013, the Magnum photographer worked alongside the Archive of Modern Conflict to create a poetic portrayal of his experiences in this part of London. It is the first show to be curated by the collective whose members are Hattie Moir, Imogen Prus, and Natasha Wigoder. The work culminated in a book and copies will be available to buy at the gallery. The Cob Gallery, 205 Royal College St, London, NW1 0SG. For more details please email: info@cobgallery.com.